It was one of those rare moments when Arnav Singh Raizada was simply sitting. A laptop was not open in front of him. Neither was his bluetooth attached to his ear. His books lay neatly arranged in alphabetical order on the distant bookshelves. Even the bright green watering can remained by the rose bush, not in use. ASR did not believe in wasting time resting or in idle chatter. He throbbed with life. Even if his physical body was in one place, his sharp mind would constantly be solving problems, coming up with ideas. His mind would be categorizing, delegating, making sure everything went perfectly as planned. Soft waves lapped in the shallow pristine blue waters of the pool. A rhythmic gurgle could be heard as the water gently dashed against the walls of its confinement. ASR’s eyes were a much darker startling pool of untold mysteries. They segued from turbulent storms to heavy downpour. Until, with a sigh he closed his eyes. In his characteristic gesture he swallowed. He tilted his head upwards. The blinding brightness of the afternoon rays, even across closed eyelids, was apparent. The heat of the sun on his face felt good. Gradually his breathing calmed. The tension in his muscles started to recede.. He recollected the scene from an hour ago..
Di had this increduluos look on her face, as if this wasn’t something that had truly sunk in yet. He himself had heard the words and groped around in the dark. This was uncharted territory. All he knew about kids was that nani and mami had a habit of teasing di about them. That scoundrel of a Shyam would simper while di would blush and giggle in reply. ASR was always safe behind his newspaper, with no intention of being part of such conversations. He did remain vigilant enough to step in if ever di appeared distressed. Thankfully he had never really needed to be part of such weird conversations because di had always been happy. But that was before..
What was he supposed to say? How was he to react? His di.. A mother? Arnav Singh Raizada.. mama? “chote…”, di had cuppsed his face and broken into a wide smile. He had no doubts her eyes were sparkling. Her eyes were shining again, crinkling at the edges. For a second ASR felt a stab of worry. Would di take this as an excuse to hide from the facts? The fact that the man she had married was a cheat and worse. Shyam was greedy, dangerous and remorseless. “di main hoon. I will always be with you. Aap akeli nai ho..” He placed his own shaking hands firmly on top of hers. She laughed. ASR was having a hard time deciding if di was genuinely okay. “And now lets concentrate on the weddings..”, she made a movement to rise from the bed. She laughed when she saw his alarmed expression. Then quickly sobered down. She wiped away a teardrop from the corner of her eyes. He felt his jaw clench and had to blink a few times. “di aap aise kyu keh reh ho?”, his voice was hoarse laced with pain. “because you were always right chote”, came her reply. “We should always face facts. Chote, ma gave up on living, but we have each other and now Khushi bhabhi.. my baby”. Her teeth were visible again as she grinned. “there is nani, mami..oh everyone.. So there is a million reasons to live, but most importantly ma always believed in goodness and love. We can’t give up on that. Agar hum pyar mein vishwas nahi karenge toh unki zindagi yuhi zaaya ho gayi. Promise me we won’t let that happen”. He had never known di to be this strong. Maybe she really was all right. The strangest realization hit him. He felt like laughing.. He was actually terribly relieved she was still talking about love. He had never thought he would be thankful for her crazy ideas of love. He had let himself break into a smile then. This di he knew. This teasing, sprightly, slightly condescending di made him feel normal. ASR opened his eyes as the sound of Khushi Kumari Gupta’s payal fell on his ears. 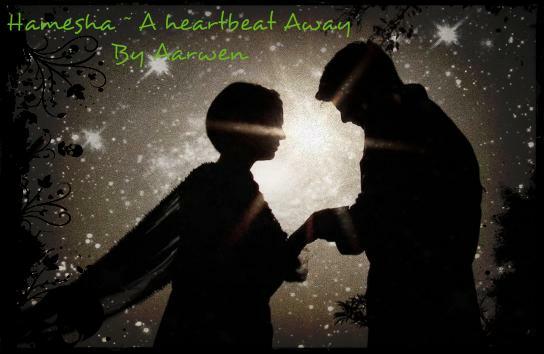 Next, he could hear her bangles as they slid across her lissom arms. She must be waving them about. No di was not just okay.. She was happy..
And this poolside, where without understanding why, he had feared that he would never see Khushi again, would now always have Khushi around. All of a sudden, he was hit by a powerful eagerness for the evening to come. He was even more eager for the wearer of that payal and those bangles to arrive before him. Khushi.. He indulged in saying the name out loud.. A disarming boyish grin appeared on his face, that would have made any heart that saw it surely melt. “humaar saaladwa koi isstealing karat rahe sasuma“, Manorma Raizada wailed. 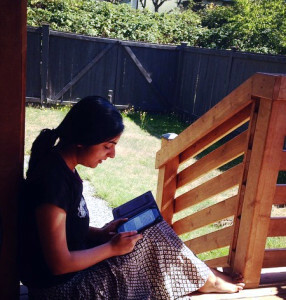 Her mother-in-law could only roll her eyes and hope that Payal bitiya would someday complain about stolen salads to Manorama so that she got a taste of her own medicine. “no noj saasuma. Shaam ko toh phull on eating karike pari. Toh abhi dieting eej impartant“, Manorma patted her bun complacently. Madhumatiji sat down on the dining table with the other ladies and peered into each dish with scary concentration. “kya hua Madhumatiji?“, The head of the Raizada family asked politely. “hai re nand kisssoore. humaar gulab jamun aur kachoriyan naahi milat hai. I kept it on the table there“, she waved around her hand in a sweeping movement. The ‘there‘ could basically have meant any part of Shantivan if one went as per the movement of her hand. “hello hi bye bye..“, Manorama was about to break into a dramatic soliloquy when one of the culprits ambled upto the table. “nani gulab jamun and kachori toh swadisht hai. Main ek poora plate kha liya“, NK announced. He sat down rubbing his tummy contently. Smug that he managed a correct Hindi word for once. “hai re nand kissore.. Natkhat nand kisore ki tarah tum bhi churakar khayat rahe maakhan“, buaji was looking loopily at the speechless boy. “err”, he was planning to make a run for it but was stopped by mami’s reproaches. “Salad? Jab gulab jamun hai and kachori main ghaas phoos kyu eat karunga mami. Something is fishy“, NK scratched his head looking all around as if crunchy leaves would appear out of thin air and mami’s salad would be found. “machli? Naahi naahi.. Pure vegetarian salad rahat.. Only pattaj.. Green green“. mami had moved her hands in the motion of swimming fish. Then hurried to reassure everyone, worried that sasuma might think she had brought in fish into the house. NK babua sometimes was quite crazy she decided. He knew she was a vegetarian. While nani was happy to see Anjali appear normal after long, Lakshmiji oblivious of her crime continued to munch on the remaining leaves in her mouth. “Maeee“, maybe she was appreciating the wedding food too. The girl is bright green and sunny yellow sat down in front of him. Then with care she broke a tiny piece of poori and held it up for him. He took the morsel into his mouth and munched. “Aap thik toh hai na Arnavji?“, a pair of large beautiful questioning eyes stared anxiously at him, as another bite was held up. She was worried for him. She wasn’t sure what all Shyamji had said, but Arnavji and di had looked pale when she had burst into the house. “I am ravenous“, he replied. The words had brought on an army of butterflies in her stomach. Those prehistoric giant butterflies the size of dinosaurs most probably. And the flapping of their wings clearly led to an undeniable acidity.. dhak dhak dhak dhak.. When he nipped at the fingers that held the food, she was sure it was to tell her how alright he was. She yelped and withdrew her hand. Her nose seemed to radiate heat and her tongue was tied in knots. Her stomach decided to rumble and her mouth opened wide in embarrassment. He laughed. As if there was no care in the world. A handsome young man enjoying himself on his wedding day. Had she called him handsome..hey devi maiyya.. Now her cheeks were aflame. “tumne kuch khaya?“, his voice dipped low and held an intimate caress. For once, she almost missed the words, as she concentrated on the plate in front. “Aise toh humne kha liya tha, par ek aur poorie toh kha hi lena chahiye.” She made a roll of the poori and stuffed it into her mouth. Food might help with the strange feeling in her stomach. He was still grinning, his face looked uncommonly boisterous. Days ago when she had seen him laugh for the first time she had thought he did not look like a laad governor while smiling.. devi maiyya I was right.. when he laughs.. In reflex, her hand went to slap her forehead. “What the“, two bedazzled brown eyes followed her movement. devi maiiya.. jab wo haste hai tab wo laad governor nai lagte.. But when does he laugh.. I could count those times on my fingers.. Aur humare toh aapki tarah das hath bhi nai hai devi maiyya.. I don’t have ten hands like you.. only two.. Bas 2 hath ke fingers mein sara counting ho jayega..
“Khushi.. One of these days you have to tell me what do you keep mumbling“.. He took a more reasonable size bit of the poori as he watched her. She got up in agitation. She didn’t want him to become serious.. but devi maiyya.. She turned to face him..
For a moment her breath left her as she looked at her Arnavji and their eyes met. He had that casual assured air around him, a slight pout on his lips. He looked inviting and dangerous. He looked like her Arnavji. “that is why .. what?“, his gaze smouldered as he took a step towards her. She shuffled her feet backwards. He moved closer. A familiar exhilarating dance that they had performed numerous times in the past. She knew she was about to hit the wall behind her when a firm voice inside her urged her to say it. Out loud. Because, she wanted him to know. “that is why I love you Arnavji“, she whispered and flashed her pearly white teeth, happily. Before he could say anything, she cut in, “par aapko.. Why me Arnavji?“, she was genuinely puzzled now. “Didn’t you say I like peace.. Even when you talk non stop and make my life chaotic I find sukoon. You bring me peace Khushi Kumari Gupta“. The laad governor could say the tenderest of words at times. His hand had found its way around her back and jerked her sinfully close. His lips hovered right above hers as he spoke. A heady husky timbre that came from a mix of desire and sincerity. The kisses that followed were a seal to the promise. A vow of two lovers. When they broke apart for some air, with a cool smirk the wicked one proceeded to remind her that their suhaag raat was a few hours away and they might as well behave themselves till then. 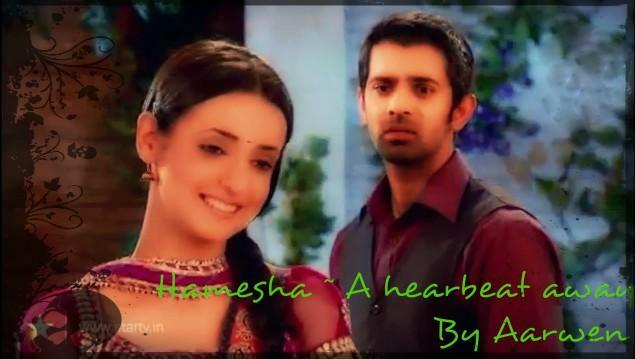 Khushi was sure this time the blush that set in was permanent. An avalanche had descended on her ears.. It was some time later that Khushi and Payal sat with their babuji. Garima was bustling around the room worried that the girls would be horribly late, but they had wanted to spend some time with their father. Not just Khushi, but even Payal had cajoled her into staying a little longer. How could she possibly say no to them! She watched them with their father. Garima could not believe he had spoken. As his voice gained strength, it felt like there was no gap of months when she had not heard him. The voice was familiar. The words he uttered were the ones she had imagined these past few months. He rested on a comfortable armchair, already wearing the cream kurta that Anjali had bought for him and her mamaji. Raw tasar silk with maroon and gold thread embroidery around the neck and small pearl buttons. He looked distinguished in it. Garima thought about the rani pink silk she was going to wear. She had been worried it was too bright for the brides mother, but Anjali had convinced her to wear it. The fall had a mauve tinge and a thick silver border right up till the aanchal. And on each pleat would show an intricate madhubani motif. On jeeji’s insistence she had even tried on the saree a few days earlier and liked it, but now she hoped she would look nice next to the man who was perfect. “Khoosie.. Payaliya.. Now get up and start getting ready“, she had to be firm. Who knew where jeeji was and these two girls showed no signs of moving! Through the open door, Nk and Akash babua came running in. At least, they were still not dressed either, she thought with a bit of relief. “Aunty humein jhootha hide karna hai.. Otherwise marna hai“, NK spoke frantically. “Nk bhai jhootha nahi joota“, her usually calm son-in-law also was apparently excited and breathless. “Akash tum decide kar lo tum meri Hindi correct karna chahte ho or do you want to hide these shoes?“, an indignant NK demanded. With a few helpful hints from Payal and Khushi, while they were busy arguing about where to hide the shoes, Anjali walked in. Garima was pleased to see the color had returned to her face. Her limp was hardly noticeable and her happiness seemed genuine and complete. She was a strong woman. Garima felt a maternal pride envelop her. A motherless girl, who had already been through too much. Yet she was here. Hopeful and strong. Garima was about to get worried. Arnav bitwa sounded angry. The kids in the room however, had all burst out laughing. And though the one downstairs was shouting currently, Garima knew for sure her daughters were getting married into a house with wonderful people. Khushi’s amma, her jiji, would have been blissful to see such a match. Her husband had turned to watch her. Their eyes met and a feeling of contentment was shared without words. Only a few more hours and her bitiyas woud be married.. I like this marriage vows very much..this is not conventional..yet the truth and love behind it bring the beauty to it.. Happy to see strong Anjali Raizada..I’m a south Indian girl..so this new kind of marriage rituals always fascinated me..hiding shoes were so fun na. Oh I haven’t been to any South Indian Weddings. Execpt in movies. I didn’t much like the rose garden scene when ASR takes Khushi there. Wanted to write a less contrived version for Hamesha. Happy that you liked the vows and Anjali feels strong.